"Poems wake us up, keep us company, and remind us that our world is big and small, And too, poems teach us how to write. Anything." Amy Ludwig VanDerwater explains in Poems Are Teachers. Students will learn how to replicate the craft techniques found in poetry to strengthen all writing, from fiction to opinion, from personal narrative to information. "Poets arrange words and phrases just as prose writers do, simply in tighter spaces," Amy argues. "In the tight space of poetry, readers can identify writing techniques after reading one page, not thirty pages." 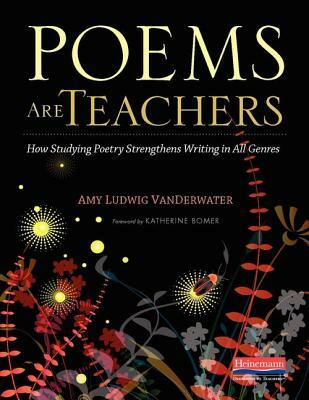 Author of Poems Are Teachers: How Studying Poetry Strengthens Writing in All Genres and co-author of Poetry: Big Thoughts in Small Packages, Amy Ludwig VanDerwater also writes books for children. Her titles include Forest Has a Song, Every Day Birds, Read! Read! Read!, and With My Hands, and her poems appear in many anthologies. A graduate of Teachers College, Columbia University, former fifth grade teacher, and writing teacher of 20 years, Amy leads school assemblies, offers writing workshops for all ages, and speaks frequently at conferences. She makes her home in Western New York, sharing snips of life at her popular classroom blog www.poemfarm.amylv.com and on Twitter @amylvpoemfarm.